Notes - by: Galen: First of all, a very big thanks to Mr. Travis S. from New York who graciously hooked me up with a fantastic ticket/seat for this performance. Although this was the exact same setlist as Detroit (which I hit the night prior), I was able to ascertain a better taping position than the night prior in beautiful, desolate & dangerous Detroit. However, it took me much longer than it should've due to torrential rain that shut down or drastically slowed highways on both sides of the border with little visibility, navigation skills that were running on 5 hours of sleep & the hell that is known as Toronto-Monday-rush-hour-in-the-rain. When I did make it to the venue after a jaunt down Younge St., the sun was out & Tool would be on shortly. Met up with Travisty at the show & waited for the performance. 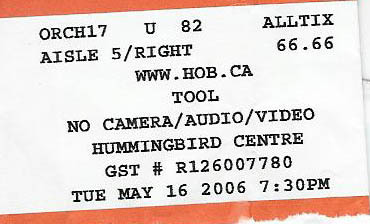 Tool arrived on stage with the standard order: Justin, Adam, Danny, MJK to the opening licks of Lost Keys. Solid performance - MJK's throat sounded to be in better shape as there were extended screams & note-holds, compared with the night prior that is. Recording itself, although not in my ideal position, came out very nice - happy with it, no complaints. The crowd was, at least, a little bit more considerate than Detroit - but then again Canadians usually have more manners than Americans. 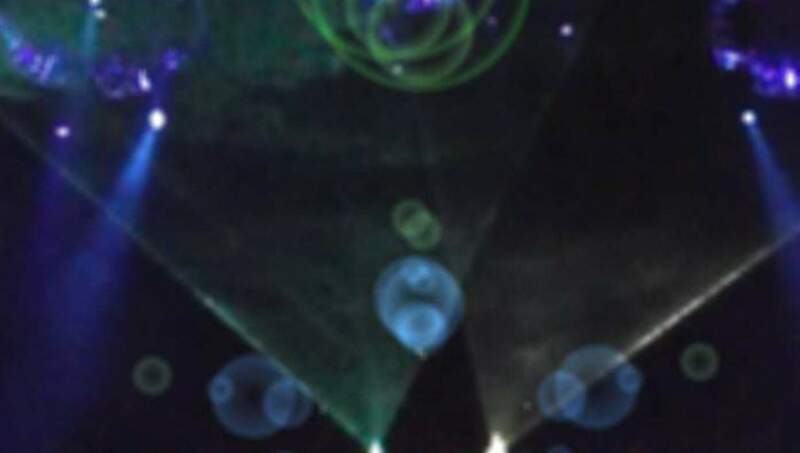 As Vicarious played, Todd Fox (MJK's head of security) shined his flashlight on some chick taking crappy digital pictures on her cheap camera. Security jumped on this situation quickly - although the hippy in the row behind me continued to smoke dope the entire show without real concern. Guess the security enjoyed the contact buzz. After the Detroit show the night prior, I asked Knobby, the sound engineer, if he would be able to save a copy of the next nights setlist (Toronto). He said "if you make it, I'll have a copy for you mate." Think he was a wee bit surprised to see me but he did get me a copy; what a nice guy. And an amazing sound engineer.